Hnin Wai Wai Nwe was born in Yangon, Myanmar. 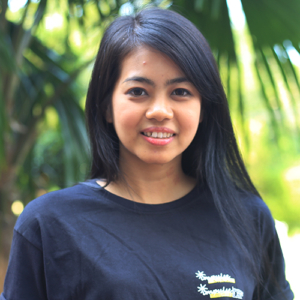 She has completed a Bachelor of Technology (Electrical Power) from Thanlyin Technological University, and is currently a third year student at Dagon University specialising in Physics. In 2012, Nwe worked as an intern journalist at Eleven Media Group, before receiving a diploma from Myanmar Journalism Institute in 2014. She has reported on a range of issues, including human trafficking, human rights of differently abled persons, the environment, entertainment, and astronomy. In 2015, she worked as an online editor and a news reporter at Eleven Broadcasting. Following five years of experience as a video journalist, producer and presenter, Nwe attended the United Nations Climate Change Conference (COP23) in Germany in 2017 as a reporter. She has recently worked as a journalist and Video Editor in Phukah Media consultant Co. Ltd. Currently, Nwe works as a Communication Consultant in Article 19 Myanmar and as a freelance journalist.